For they have consulted together with one consent; they form a confederacy against You: The tents of Edom... Oh, how Esau shall be searched out! How his hidden treasures shall be sought after! All the men in your confederacy shall force you to the border; the men at peace with you shall deceive you and prevail against you. Those who eat your bread shall lay a trap for you. No one is aware of it. As discussed earlier, the "tents of Edom" are almost certainly the Palestinian people of today. The wording about being forced to the border in Obadiah supports this notion, as the Palestinians live as refugees in the bordering areas of Israel: the Gaza Strip and the West Bank. The rest of the passage here in Obadiah accurately describes how the surrounding countries have forced the Palestinian people to live as refugees. These countries have, in effect, been using the Palestinians as pawns in the fight against Israel, rather than absorbing them into their own countries after Israel won their war of independence in 1948. Their deception and laying a trap for the descendants of Esau supports the idea that the "tents of Edom" are pawns, or bait in a trap to defeat Israel. The passages in Psalm 83 and Obadiah show that it will be the Palestinians who will lead the confederacy. Today, terrorist groups are largely present in the Palestinian leadership, and are monetarily supported by neighboring countries. It would be no surprise if these terrorist groups lead the way in forming the confederacy against Israel. They have worked together toward the common goal to get rid of Israel since the nation was reborn. Their current goal is to divide Israel under the guise of giving a homeland to the Palestinians. But in reality it would weaken Israel and allow their enemies to more easily defeat them. The vision of Obadiah. Thus says the Lord GOD concerning Edom (we have heard a report from the LORD, and a messenger has been sent among the nations, saying, "Arise, and let us rise up against her for battle"): "Behold, I will make you small among the nations; you shall be greatly despised. The pride of your heart has deceived you, you who dwell in the clefts of the rock, whose habitation is high; you who say in your heart, 'Who will bring me down to the ground?' though you ascend as high as the eagle, and though you set your nest among the stars, from there I will bring you down," says the LORD. "I have heard a message from the LORD, and an ambassador has been sent to the nations: saying, "Gather together, come against her, and rise up to battle! "For indeed, I will make you small among nations, despised among men. Your fierceness has deceived you, the pride of your heart, O you who dwell in the clefts of the rock, who hold the height of the hill! Though you make your nest as high as the eagle, I will bring you down from there," says the LORD. "Because you have said, 'These two nations and these two countries shall be mine, and we will possess them,' although the LORD was there, therefore, as I live," says the Lord GOD, "I will do according to your anger and according to the envy which you showed in your hatred against them; and I will make Myself known among them when I judge you." 'Thus says the Lord GOD: "The whole earth will rejoice when I make you desolate. As you rejoiced because the inheritance of the house of Israel was desolate, so I will do to you; you shall be desolate, O Mount Seir, as well as all of Edom - all of it!"' Then they shall know that I am the LORD.' Then he looked on the Kenites, and he took up his oracle and said: "Firm is your dwelling place, and your nest is set in the rock; nevertheless Kain shall be burned. How long until Asshur carries you away captive?" Then he took up his oracle and said: "Alas! Who shall live when God does this? But ships shall come from the coasts of Cyprus, and they shall afflict Asshur and afflict Eber...."
Habakkuk 2:4-5, 9 - "Behold the proud, his soul is not upright in him; but the just shall live by his faith. "Indeed, because he transgresses by wine, he is a proud man, and he does not stay at home. Because he enlarges his desire as hell, and he is like death, and cannot be satisfied..." Woe to him who covets evil gain for his house, that he may set his nest on high, that he may be delivered from the power of disaster! The phrase "your nest among the stars" may also allude to the spiritual aspect of the Palestinian's pride; being that Allah supposedly resides in the heavens. In addition to their pride, fundamental Muslims today also carry fierceness and hatred in their hearts, as prophesied by Jeremiah and Ezekiel. In the Numbers 24 passage, we see a prophecy with the same phrase: "nest dwelling in a rock." While Edom appears earlier in this passage, these particular verses in Numbers 24 dictate a prophecy against Eber and the Kenites. The Kenites were a clan of the Midianites who migrated under their leader Eber (or Heber) near Kadesh (Judges 4:11), which was later part of the northern kingdom of Israel the Assyrians eventually conquered. So we see that this passage has already been fulfilled in history. However, the beginning of this prophecy in Numbers 24:14 is for the "latter days." Assuming that not all Kenites left the area after the Assyrian conquest and Israeli exile, those who remained likely absorbed into Arab people of the region, who today include the Palestinians. Ezekiel goes into detail in the passages above, explaining the coming judgment on the Edomites. The "ancient hatred" described by Ezekiel against Israel goes way back to Hagar, Ishmael, Esau, and Lot, whose descendants make up the Arab nations and the Palestinian people of today. After World War II, Great Britain set aside and divided the region known as "Palestine" into two nations; one for the Jews and one for the Arabs. After Israel declared their independence, the "ancient hatred" of Israel's neighbors manifested into a war to try to prevent the Jews from forming a state and to take both nations for themselves, just as the prophet Ezekiel foretold centuries ago (Ezekiel 35:10). Israel won their war of independence because God was there with them. However, the passage above in Ezekiel is clear that future judgment is coming to these people because of their "ancient hatred" and greed to take the land. "Will I not in that day," says the LORD, "Even destroy the wise men from Edom, and understanding from the mountains of Esau? Then your mighty men, O Teman, shall be dismayed, to the end that everyone from the mountains of Esau may be cut off by slaughter." "For violence against your brother Jacob, shame shall cover you, and you shall be cut off forever. In the day that you stood on the other side - in the day that strangers carried captive his forces, when foreigners entered his gates and cast lots for Jerusalem - even you were as one of them." "But you should not have gazed on the day of your brother in the day of his captivity; nor should you have rejoiced over the children of Judah in the day of their destruction; nor should you have spoken proudly in the day of distress." "You should not have entered the gate of My people in the day of their calamity. Indeed, you should not have gazed on their affliction in the day of their calamity, nor laid hands on their substance in the day of their calamity." "You should not have stood at the crossroads to cut off those among them who escaped; nor should you have delivered up those among them who remained in the day of distress." Moreover the word of the LORD came to me, saying, "Son of man, set your face against Mount Seir and prophesy against it, and say to it, 'Thus says the Lord GOD: "Behold, O Mount Seir, I am against you; I will stretch out My hand against you, and make you most desolate; I shall lay your cities waste, and you shall be desolate. Then you shall know that I am the LORD." "Because you have had an ancient hatred, and have shed the blood of the children of Israel by the power of the sword at the time of their calamity, when their iniquity came to an end, therefore, as I live," says the Lord GOD, "I will prepare you for blood, and blood shall pursue you; since you have not hated blood, therefore blood shall pursue you." "Thus I will make Mount Seir most desolate, and cut off from it the one who leaves and the one who returns. And I will fill its mountains with the slain; on your hills and in your valleys and in all your ravines those who are slain by the sword shall fall." "I will make you perpetually desolate, and your cities shall be uninhabited; then you shall know that I am the LORD." God judged the Edomites for their haughtiness against the Jews when God punished Judah for their iniquity; during the "calamity" of the Babylonian conquest (2 Kings 22:16), after the Babylonian "captivity" (2 Kings 24-25), after the "destruction" of Jerusalem (Jeremiah 17:18-27), and during the "distress" when they tried to rebuild Jerusalem (Nehemiah 2:17). In light of the unfulfilled prophecies in neighboring passages, and the fact that Edom is not a perpetual wasteland (though it is fairly desolate), there is yet future complete fulfillment of these prophecies. Some believe the "calamity" of the Jews goes beyond the Babylonian captivity and exile. There were similar offenses after the time of Obadiah, where the descendants of the Edomites were haughty and delivered the Jews up in the time of the Roman rule, and during the Holocaust too. Incidentally, there were many Arab leaders allied with Hitler during the Holocaust who worked to prevent Jewish people from fleeing to Israel. In one particular case, Arabs stopped 900 children from Hungary on their way to Israel and sent them to Poland to a concentration camp (source). "In that day it shall come to pass that the glory of Jacob will wane, and the fatness of his flesh grow lean. It shall be as when the harvester gathers the grain, and reaps the heads with his arm; it shall be as he who gathers heads of grain in the Valley of Rephaim. Yet gleaning grapes will be left in it, like the shaking of an olive tree, two or three olives at the top of the uppermost bough, four or five in its most fruitful branches," Says the LORD God of Israel. "If thieves had come to you, if robbers by night - Oh, how you will be cut off! - Would they not have stolen till they had enough? If grape-gatherers had come to you, would they not have left some gleanings?" "If grape-gatherers came to you, would they not leave some gleaning grapes? If thieves by night, would they not destroy until they have enough? But I have made Esau bare; I have uncovered his secret places, and he shall not be able to hide himself. His descendants are plundered, his brethren and his neighbors, and he is no more. Leave your fatherless children, I will preserve them alive; and let your widows trust in Me." Joel 3:13 - Put in the sickle, for the harvest is ripe. Come, go down; for the winepress is full, the vats overflow - for their wickedness is great. Revelation 14:19-20 - So the angel thrust his sickle into the earth and gathered the vine of the earth, and threw it into the great winepress of the wrath of God. And the winepress was trampled outside the city, and blood came out of the winepress, up to the horses' bridles, for one thousand six hundred furlongs. Romans 9:25-26 - As He says also in Hosea: "I will call them My people, who were not My people, and her beloved, who was not beloved. And it shall come to pass in the place where it was said to them, 'You are not My people,' There they shall be called sons of the living God." In the parallel passages above, the wording about only "gleanings" left after the harvest of grapes alludes to a large loss of life for Israel. The picture of a few olives left after the shaking of the tree at the harvest in the Isaiah passage also shows the massive loss of life. Israel became a nation in 1948, but as mentioned a few sections ago, Ezekiel 37 shows us that they are spiritually dead; their judgment as grapes on a vine supports this understanding. Since Israel is spiritually dead like a wasted and burned vineyard (Isaiah 5), they are not saved, being cut out of the olive tree (Romans 11), corporately speaking. As we will see later, it is after this war that Israel begins to turn to God. There is also a shift of God's attention back to Israel. At this point, Israel, being likened to grapes of the vine and the olive tree, will start to come alive spiritually as prophesied in Ezekiel 37. We will discuss what happens to Israel in more detail later. Jeremiah 49:10 - ...his descendants are plundered, his brethren, and his neighbors, and he is no more. Deal with them as with Midian, as with Sisera, as with Jabin at the Brook Kishon, who perished at En Dor, who became as refuse on the earth. Make their nobles like Oreb and like Zeeb, yes, all their princes like Zebah and Zalmunna, who said, "Let us take for ourselves the pastures of God for a possession." "And you, son of man, prophesy to the mountains of Israel, and say, 'O mountains of Israel, hear the word of the LORD! Thus says the Lord GOD: "Because the enemy has said of you, 'Aha! The ancient heights have become our possession,'"' therefore prophesy, and say, 'Thus says the Lord GOD: "Because they made you desolate and swallowed you up on every side, so that you became the possession of the rest of the nations, and you are taken up by the lips of talkers and slandered by the people" - therefore, O mountains of Israel, hear the word of the Lord GOD! Thus says the Lord GOD to the mountains, the hills, the rivers, the valleys, the desolate wastes, and the cities that have been forsaken, which became plunder and mockery to the rest of the nations all around - therefore thus says the Lord GOD: "Surely I have spoken in My burning jealousy against the rest of the nations and against all Edom, who gave My land to themselves as a possession, with wholehearted joy and spiteful minds, in order to plunder its open country."' The fortress also will cease from Ephraim. Psalm 83 and Ezekiel 36 both show that Israel's enemies want to take land that God promised to His people. These passages show that the Edomites want the mountains of Israel. You can see on the first map to the right that the mountains are in the West Bank, which is an area the Palestinians want for themselves. This supports that the Palestinians are descendants of Edom. The mountains of Israel also include the Golan Heights, which is a strategic mountainous region in north Israel, and an area contested by Syria. Palestinians and Syrians both want to take these "ancient heights" either through peace treaties or by force. But Ezekiel 36:8-12 indicates Israel will never lose the "ancients heights" again after return from the global exile. Therefore, God will intervene before the West Bank or the Golan Heights are given away or taken from Israel. This is important to note, because the current peace process that includes giving the Palestinians the West Bank is against God's plan, and therefore will never come to fruition. Isaiah's passage shows that the "fortresses of Ephraim" will cease-to-exist. On the map to the left we see that the territory of Ephraim lies just north of Jerusalem, in the central part of the West Bank. The "fortresses" mentioned in Isaiah could be pointing to terrorist headquarters located there. In other words, Palestinian terrorist strongholds might be targeted and destroyed in this conflict, as they have been in other conflicts between Israel and the Palestinians. there shall be no inhabitant." My house because of the army, because of him who passes by and him who returns. No more shall an oppressor pass through them, for now I have seen with My eyes. The seacoast shall be pastures, with shelters for shepherds and folds for flocks. The coast shall be for the remnant of the house of Judah; they shall feed their flocks there; in the houses of Ashkelon they shall lie down at evening. For the LORD their God will intervene for them, and return their captives. 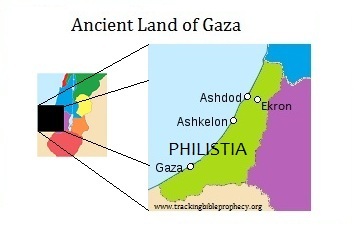 The ancient land of Philistia, or Gaza is the area that is known today as the Gaza Strip. 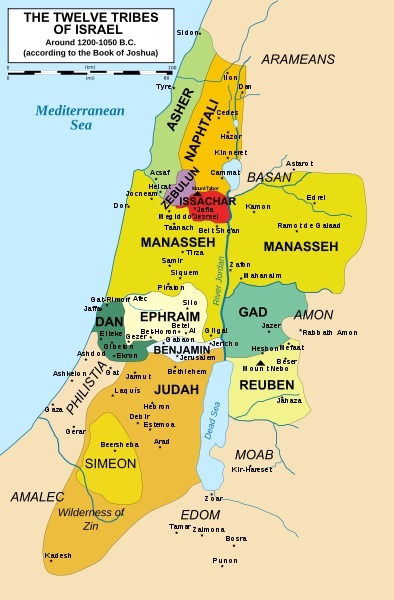 Ashkelon, Ashdod, and Ekron were cities in Philistia. The current inhabitants of the Gaza Strip are Palestinians. The end-result is the same for the Palestinians in Gaza as that of their brothers who live in the West Bank; the land they live in today will be laid waste. Amos tells us that God will "cut off" the inhabitants of the cities and the "remnant of the Philistines." This Philistine remnant, like the Edomites, is undoubtedly within the genome of the Palestinian people today. After the war, part of the Gaza Strip will be unsuitable for even animals to live in, which supports the notion that this is a nuclear war. However, Zephaniah shows that Gaza will become pastures for Israel at some point in the future, probably after the Lord renovates the earth in the Millennium. Zechariah 9 was partly fulfilled by the conquest of Alexander the Great. The complete fulfillment will be in the time leading up to the return of Christ. Captives from the war will settle and intermingle in Ashdod, which is a city in northern Gaza. Apparently the captives go to Ashdod willingly. Perhaps it is because they will follow the God of Israel after the war, according to Zechariah 9:7. Both Zechariah and Zephaniah show that the tribe of Judah will live on the coast near Ashkelon, which shows that Gaza will belong to Israel. This dispels the theory that many hold to, in that the covenant in Daniel 9:27 will include provisions for a Palestinian state that includes Gaza. In addition, as we saw in the last section, Israel will never lose the West Bank again. So we see that the current "peace process" will never come fruition. As we will see later, the "Great Middle East War" occurs before the "Day of the Lord" commences, which poses another problem for the popular theory that the covenant in Daniel 9 includes provisions for a Palestinian state. If Israel retains sovereignty over this land and the Palestinians are nearly annihilated, then the current peace process will no longer be viable, let alone last for 3 ½ years into the Tribulation, as determined by the prophecy in Daniel 9:27. I discuss this peace covenant further in the "Pre-Tribulation Rapture" study. For they have consulted together with one consent; they form a confederacy against You: The tents of Edom and the Ishmaelites; Moab and the Hagrites; Gebal, Ammon, and Amalek; Philistia with the inhabitants of Tyre; Assyria also has joined with them; they have helped the children of Lot. Selah Thus says the LORD: "For three transgressions of Edom, and for four, I will not turn away its punishment, because he pursued his brother with the sword, and cast off all pity; his anger tore perpetually, and he kept his wrath forever. But I will send a fire upon Teman, which shall devour the palaces of Bozrah." "Will I not in that day," says the LORD, "Even destroy the wise men from Edom, and understanding from the mountains of Esau? Then your mighty men, O Teman, shall be dismayed, to the end that everyone from the mountains of Esau may be cut off by slaughter." Then he looked on Amalek, and he took up his oracle and said: "Amalek was first among the nations, but shall be last until he perishes." Against Edom. Thus says the LORD of hosts: "Is wisdom no more in Teman? Has counsel perished from the prudent? Has their wisdom vanished? Flee, turn back, dwell in the depths, O inhabitants of Dedan! For I will bring the calamity of Esau upon him, the time that I will punish him." For thus says the LORD: "Behold, those whose judgment was not to drink of the cup have assuredly drunk. And are you the one who will altogether go unpunished? You shall not go unpunished, but you shall surely drink of it. For I have sworn by Myself," says the LORD, "that Bozrah shall become a desolation, a reproach, a waste, and a curse. And all its cities shall be perpetual wastes." "Edom also shall be an astonishment; Everyone who goes by it will be astonished and will hiss at all its plagues. As in the overthrow of Sodom and Gomorrah and their neighbors," says the LORD, "No one shall remain there, nor shall a son of man dwell in it." Therefore hear the counsel of the LORD that He has taken against Edom, and His purposes that He has proposed against the inhabitants of Teman. The earth shakes at the noise of their fall; at the cry its noise is heard at the Red Sea. Behold, He shall come up and fly like the eagle, And spread His wings over Bozrah; the heart of the mighty men of Edom in that day shall be like the heart of a woman in birth pangs. The area described in these passages covers the southern part of current day Jordan. Most of these verses have seen partial fulfillment, but since this area is not a "perpetual waste," complete fulfillment is yet future. Judgment by fire makes the enemy cities desolate, which suggests nuclear warfare, as mentioned earlier. 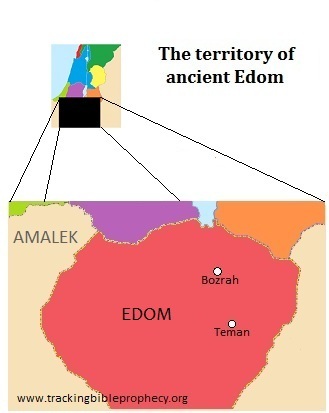 The name most associated with this area in the Bible is Edom. The Amalekites and the Edomites both lived in southern Jordan. Teman was an Edomite who built a city after his name in Edom. Bozrah was the capital city of Edom. The Amalekites dwelt not only in southern Jordan, but also west into the Negev and the border of the Sinai, which Egypt occupies. The Sinai is not mentioned in any parallel passage, and thus probably not a factor in this conflict. Dedan is in Saudi Arabia along the Red Sea, southeast of the Negev and south of Jordan. Remember that the Ishmaelites and Hagrites absorbed into the neighboring Arab countries over the centuries. Some of these ancestors could be the inhabitants of Dedan, who are members of terrorist or rebel groups that join the confederacy, but warned to turn back home before they share in the judgment meant for the inhabitants of Jordan. Saudi Arabia as a nation is not involved in the conflict. Isaiah 63:1-3 - Who is this who comes from Edom, with dyed garments from Bozrah, this One who is glorious in His apparel, traveling in the greatness of His strength? - "I who speak in righteousness, mighty to save." Why is Your apparel red, and Your garments like one who treads in the winepress? "I have trodden the winepress alone, and from the peoples no one was with Me. For I have trodden them in My anger, and trampled them in My fury; their blood is sprinkled upon My garments, and I have stained all My robes. Isaiah 34:5-10 - "For My sword shall be bathed in heaven; indeed it shall come down on Edom, and on the people of My curse, for judgment. The sword of the LORD is filled with blood, it is made overflowing with fatness, with the blood of lambs and goats, with the fat of the kidneys of rams. For the LORD has a sacrifice in Bozrah, and a great slaughter in the land of Edom. The wild oxen shall come down with them, and the young bulls with the mighty bulls; their land shall be soaked with blood, and their dust saturated with fatness." For it is the day of the LORD's vengeance, the year of recompense for the cause of Zion. Its streams shall be turned into pitch, and its dust into brimstone; its land shall become burning pitch. It shall not be quenched night or day; its smoke shall ascend forever. From generation to generation it shall lie waste; no one shall pass through it forever and ever. For they have consulted together with one consent; they form a confederacy against You: The tents of Edom and the Ishmaelites; Moab and the Hagrites; Gebal, Ammon, and Amalek; Philistia with the inhabitants of Tyre; Assyria also has joined with them; they have helped the children of Lot. Selah Thus says the LORD: "For three transgressions of Moab, and for four, I will not turn away its punishment, because he burned the bones of the king of Edom to lime. But I will send a fire upon Moab, and it shall devour the palaces of Kerioth; Moab shall die with tumult, with shouting and trumpet sound. And I will cut off the judge from its midst, and slay all its princes with him," says the LORD. The cities of Aroer are forsaken they will be for flocks Which lie down, and no one will make them afraid. "Therefore, as I live," Says the LORD of hosts, the God of Israel, "Surely Moab shall be like Sodom, and the people of Ammon like Gomorrah - overrun with weeds and saltpits, and a perpetual desolation...." "I see Him, but not now; I behold Him, but not near; a Star shall come out of Jacob; a Scepter shall rise out of Israel, and batter the brow of Moab, and destroy all the sons of tumult." 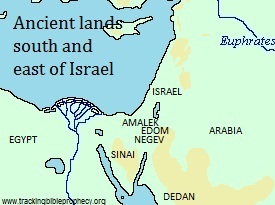 The geographical area of Moab lies directly to the north of Edom. Like Edom, Moab will become a perpetual desolation. We see the use of "fire" again in these passages. As mentioned before, the devastation described suggests that the "fire" is nuclear. In the Zephaniah passage, God compares Moab's destiny to that of Sodom and Gomorrah, who became overrun with salt pits after their destruction with fire and brimstone. While Jordan is a fairly desolate area, the area of ancient Moab is not a "perpetual desolation... overrun with weeds and salt pits." Therefore, this prophecy is yet future. Jeremiah 48:45 - "Those who fled stood under the shadow of Heshbon because of exhaustion. But a fire shall come out of Heshbon, a flame from the midst of Sihon, and shall devour the brow of Moab, the crown of the head of the sons of tumult." Amos 2:2 - But I will send a fire upon Moab, and it shall devour the palaces of Kerioth; Moab shall die with tumult, with shouting and trumpet sound. Numbers 24:17 - ...And batter the brow of Moab, and destroy all the sons of tumult. A "tumult" describes a violent and noisy uprising. In this case, it is Israel's enemy neighbors who make a "tumult." It is interesting to note, that in the first months of 2011 many of the nations listed in Psalm 83, and several in Ezekiel 38 started uprisings against their established governments. Eventually, many of these nations will come together against Israel in a "tumult" in the "Great Middle East War." For they have consulted together with one consent; they form a confederacy against You: The tents of Edom and the Ishmaelites; Moab and the Hagrites; Gebal, Ammon, and Amalek; Philistia with the inhabitants of Tyre; Assyria also has joined with them; they have helped the children of Lot. Selah Thus says the LORD: "For three transgressions of the people of Ammon, and for four, I will not turn away its punishment, because they ripped open the women with child in Gilead, that they might enlarge their territory. But I will kindle a fire in the wall of Rabbah, and it shall devour its palaces...." "Therefore, as I live," says the LORD of hosts, the God of Israel, "Surely Moab shall be like Sodom, and the people of Ammon like Gomorrah - overrun with weeds and saltpits, and a perpetual desolation. The residue of My people shall plunder them, and the remnant of My people shall possess them. This they shall have for their pride, because they have reproached and made arrogant threats against the people of the LORD of hosts." for Milcom shall go into captivity with his priests and his princes together. Why do you boast in the valleys, your flowing valley, O backsliding daughter? Who trusted in her treasures, saying, 'Who will come against me?' Behold, I will bring fear upon you," says the Lord GOD of hosts, "From all those who are around you; you shall be driven out, everyone headlong, and no one will gather those who wander off. But afterward I will bring back the captives of the people of Ammon," says the LORD. 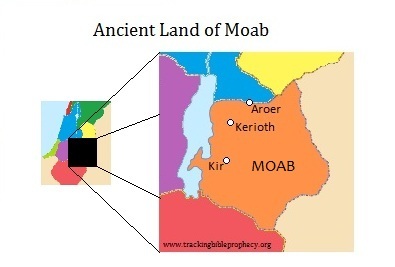 Recall from Genesis, Moab and Ammon were descendants of Lot. Moab and Ammon will become a perpetual desolation like Sodom and Gomorrah. Again we see the use of fire that causes devastation on a nuclear scale. We discover in these passages that Israel will gain land in the war. The area of Gilead described in Amos was in the tribal region of Gad, which bordered the ancient territory of Ammon in northern Jordan. 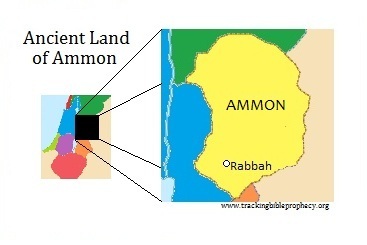 Rabbah was a prominent city in Ammon in Jeremiah's day. Today Rabbah is known as Amman, which is the capital of Jordan. The passage above in Zephaniah adds irony to the situation. What the people of Moab and Ammon (aka Jordanians) had planned against Israel in their pride and arrogance will come back on their heads; Jordan will lose their sovereignty to Israel. In reality though, the people of Jordan live on land that God promised to give to Israel, which makes it rightfully theirs. However, the prophecy in Zephaniah shows that the area of ancient Ammon will be a "perpetual desolation, overrun with weeds and salt pits," and not much use to Israel anyway. The passage in Jeremiah is a prophecy that has seen partial fulfillment in history. When the Assyrians exiled the northern kingdom of Israel, the Ammonites moved into the land of Gad. Because they took what wasn't theirs, God judged the Ammonite people in the Babylonian conquest. However, Israel did not take back their land at that time, but as shown in Zephaniah they will possess the land after the "Great Middle East War." As a side note, Milcom was the god of the Ammonites. When the Assyrians conquered the Ammonites, Jeremiah said that their god would go with them into captivity defeated. Later we will see that God defeats the gods of the world in the "Great Middle East War," much like what happened when the Assyrians conquered the Ammonites. Today, Israel's enemy neighbors bow to one god, the Muslim god "Allah." Therefore, God will defeat Allah in the "Great Middle East War." For they have consulted together with one consent; they form a confederacy against You: The tents of Edom and the Ishmaelites; Moab and the Hagrites; Gebal, Ammon, and Amalek; Philistia with the inhabitants of Tyre; Assyria also has joined with them; they have helped the children of Lot. Selah But ships shall come from the coasts of Cyprus, and they shall afflict Asshur and afflict Eber, and so shall Amalek, until he perishes. The burden against Damascus. "Behold, Damascus will cease from being a city, and it will be a ruinous heap.... The kingdom from Damascus, and the remnant of Syria." Thus says the LORD: "For three transgressions of Damascus, and for four, I will not turn away its punishment, because they have threshed Gilead with implements of iron. But I will send a fire into the house of Hazael, which shall devour the palaces of Ben-Hadad. I will also break the gate bar of Damascus, and cut off the inhabitant from the Valley of Aven, and the one who holds the scepter from Beth Eden. The people of Syria shall go captive to Kir," Says the LORD. Against Damascus. "Hamath and Arpad are shamed, for they have heard bad news. They are fainthearted; there is trouble on the sea; it cannot be quiet. Damascus has grown feeble; she turns to flee." "And fear has seized her. Anguish and sorrows have taken her like a woman in labor. Why is the city of praise not deserted, the city of My joy? Therefore her young men shall fall in her streets, and all the men of war shall be cut off in that day," says the LORD of hosts. ...Wail, O oaks of Bashan, for the thick forest has come down. There is the sound of wailing shepherds! For their glory is in ruins. There is the sound of roaring lions! For the pride of the Jordan is in ruins. These passages cover several people groups and cities in the regions of Assyria and Damascus. Starting in Amos, Gilead was a mountainous region east of the Jordan River that covered most of the Israeli tribal regions of Gad, Reuben, and Manasseh. Hazael and Ben-Hadad were leaders in Damascus when this prophecy was partly fulfilled in history. 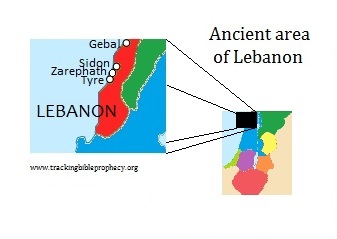 The Valley of Aven was just east of Lebanon. Beth Eden was a city in the Assyrian empire between the Euphrates and Balik rivers in northern Syria. In the Jeremiah passage, Hamath and Arpad were gods of the people in the area when Jeremiah wrote his prophecy. Hamath is a city in Assyria northeast of Lebanon. In the Zechariah passages, Hadrach is north of Lebanon in Assyria. Bashan is the mountainous region in the area today known as the Golan Heights, which is on the border between Israel and Syria. In the prophecy in the book of Numbers, Asshur, another name for Assyria, appears next to Eber and Amalek, whom we discussed earlier. These verses in Isaiah about destruction of Damascus have probably gotten the most attention of those who have studied the "Great Middle East War," next to Psalm 83. Damascus is the longest inhabited city in history; conquered and rebuilt several times, but never-ceasing as a city. Therefore, a future fulfillment is in store for this prophecy. 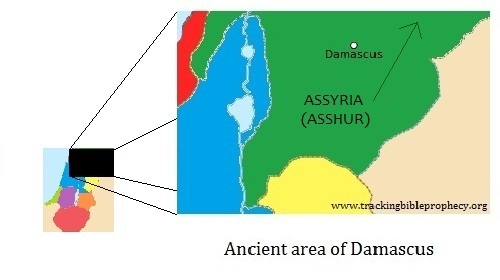 Damascus became a prominent city under the Arameans, but was later conquered by the Assyrians. While the Assyrian empire extended over a larger area, including much of current day Iraq, the heart of the kingdom centered on northern Syria and western Iraq and did not include Damascus. We will touch more on western Iraq later. Though Damascus was not part of the seat of Assyria, nor were they part of Assyria when Aspah wrote Psalm 83, the passage in Jeremiah suggests that both northern and southern Syria are tied together in this prophecy, which is interesting since both regions constitute one nation today. In other words, Damascus and Assyria could be considered separate regions since Damascus was not part of the seat of Assyria, yet they are found together in Jeremiah, which may mean the prophet saw Damascus and the region mentioned in western Assyria as one nation at the time of fulfillment; today that is the case. On the other hand, Damascus is not listed as a member of the Psalm 83 confederacy, but Assyria is. This could mean a few things. Perhaps Damascus is part of Assyria when the prophecy gets fulfilled since they are found together in Jeremiah. Another possibility is that the country of Syria is in a state of faction before the "Great Middle East War," but then join together against Israel once the war starts. Syria's civil war that began in 2011 has torn the country apart, with the government maintaining control over southern Syria and the insurgents taking control over northern Syria (source). We will touch more on this later. ["The city of praise"] is obviously Jerusalem. According to Jeremiah, it "had not been abandoned" - implying that given the events he saw prophetically might have expected people to flee, but they did not. The Amplified Bible puts it this way: "How [remarkable that] the renowned city is not deserted, the city of my joy!" This is all conjecture, but consider this: one thing that would prompt Israel to use weapons of mass destruction (nuclear) against Damascus would be if they were responding in kind to the use of weapons of mass destruction (biological and/or chemical) by the Syrians. Perhaps that is what Jeremiah saw, and thus would have expected to see people abandoning Jerusalem, except for the fact that Israel put a stop to it by bombing Damascus. As a side note, the ships coming from the coast of Cyprus in the Numbers passage is interesting. Since we know from earlier verses in this passage that Israel will be taking dominion over her neighbors, then these ships coming from Cyprus are most likely Israeli ships. Currently, Israel has an economic alliance with Cyprus, but they are currently seeking to build a military friendship as well. 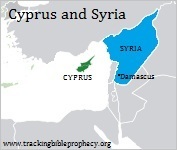 There is even talk of Israel building a military base in Cyprus (source). "For three transgressions of Tyre, and for four, I will not turn away its punishment, because they delivered up the whole captivity to Edom, and did not remember the covenant of brotherhood. But I will send a fire upon the wall of Tyre, which shall devour its palaces." ...And against Tyre and Sidon, though they are very wise. For Tyre built herself a tower, heaped up silver like the dust, and gold like the mire of the streets. Behold, the Lord will cast her out; He will destroy her power in the sea, and she will be devoured by fire. The parity covenant was made between people of approximately equal status. The covenant was normally entered into willingly by both parties. It would be first proposed by one side, and then accepted by the other, before being sealed by an oath and eating a meal together. The two parties normally refer to each other as "brothers," showing their equality. A parity covenant is only made between two human beings, never between God and his people. Covenants were serious business during the time of Solomon. To break an oath could mean a lawsuit, or in the case of breaking God's covenant, judgment. Click here to read more about covenants, also known as vows or oaths in the Bible. When Assyria forced the northern tribes into exile, Tyre apparently played a part in helping move Israeli exiles to Edom, which at the time was under Assyrian rule. Later, when the Babylonians exiled Judah, Ezekiel 26 shows that Tyre turned against Israel and coveted the vacated land. In other words, they forgot about their covenant with Israel and spoke against them more like enemies than friends or brothers. This prophecy in Amos was partly fulfilled in history when God judged Tyre by the Babylonian siege. Today, Lebanon is once again attempting to deliver up Israel. Their government is in favor of the current peace process that would divide Israel. Meanwhile, the Hezbollah terrorist stronghold in Lebanon would like to see the Jews annihilated, so they can take the land for themselves. Both groups are in opposition to God's will. Therefore, God will judge Lebanon and Hezbollah. The parallel passages in Psalm 83 and Zechariah 9-11 show that, like the rest of their neighbors, Lebanon will receive judgment by fire. We have now finished looking at each member of the Psalm 83 confederacy. In the rest of this study we will discover God's purpose and Israel's role in the "Great Middle East War." We will also look at other future events tied to this prophetic war.